Rock Paper Scissors Doom is inspired by the Rock Paper Scissors boss battles from Alex The Kidd in Miracle World, but in this version you face the enemies of Doom. There is some tricks to beat the ai, its not all random. 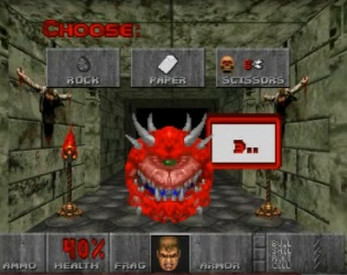 Different levels of difficulty, each with more enemies types, and Nightmare difficulty has a different level theme. Each successful play through will grant you a different keycard to show how well you played through. For example, if you beat the easiest setting never getting hurt, next time you go to the difficulty setting it will show a Yellow keycard beside that setting. To install unzip the .apk from the zip folder and transfer it to your android device. Use a android root browser to locate and run the .apk, this should install the game to your android device.